Pourable, self levelling cement screed, suitable for thicknesses from 1mm to 10mm. Distinguished for its high resistance to compression and abrasion. Also distinguished for its strong adhesion as well as its excellent rheology, workability and ability to be pumped. 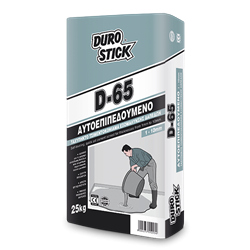 Ideal for rapid levelling and for smoothing of concrete floors, cement screeds or existing mosaics to be lined with marble, tiles, vinyl flooring, carpet, hardwood flooring, microcemento (pressed cement screed) and other lining materials. It yields a very smooth finish, which is able to remain as a finish surface for basement floors, lofts, household storage rooms etc. Classified CT-C30-F6-AR2 per EN 13813.